The US is allegedly considering the possibility of sending a naval presence and aircraft close to the reefs China has been constructing in the disputed Spratly Islands in the strategic South China Sea. “We are considering how to demonstrate freedom of navigation in an area that is critical to world trade,” a US official, speaking on condition of anonymity, told Reuters. They added that any options would have to be approved by Washington. According to the official, the US Defense Secretary Ash Carter has requested options that include sending ships and aircraft within 12 nautical miles (22 kilometers) of reefs in the Spratly Islands. Sending ships and aircraft near the artificial islands appears to be in line with the so-called US military "Freedom of Navigation" operations. China's Ministry of Foreign Affairs said on Wednesday it is "deeply concerned" by reports about the US sending ships to the South China Sea. They demanded a clarification. A US Department of Defense (DoD) report, published last week, lashed out at Beijing for China's military actions in the South China Sea where rapid construction of artificial islands has been underway. China began reclaiming land there last year. Beijing claims as its own nearly the entire area, which is rich in natural resources and is a main trade route. According to the Pentagon, the islands currently total 2,000 acres (800 hectares), with 75 percent built over the past five months. Apart from China, five countries - Brunei, Malaysia, the Philippines, Taiwan and Vietnam - lay claim to parts of the Spratly archipelago and surrounding waters. While Beijing says its safeguarding territorial sovereignty and security interests in the South China Sea "are justified,” Washington says that five emerging outposts in the Spratly Islands could be used for surveillance systems, harbors and logistical support. While it's unclear what will ultimately be built on the expanded outposts, the DoD report warns that "China will be able to use them as persistent civil-military bases of operation to enhance its presence significantly in disputed areas." The US fears Beijing's activities could consequently lead to a potential air defense identification zone (ADIZ) over the South China Sea, akin to one China declared in the East China Sea in 2013 over the disputed Japanese-held islands. At the time, the US responded by flying B-52 bombers through the zone in a show of force. 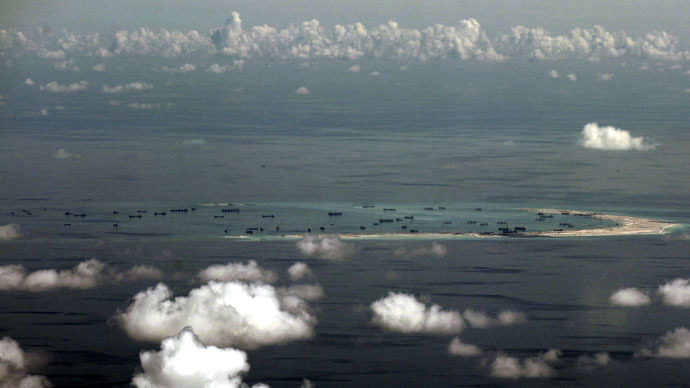 Recent satellite images shared with Reuters by Washington's Center for Strategic and International Studies (CSIS) have shown that since around March 2014 China has been carrying out reclamation work at seven sites in the Spratlys and is constructing a military-sized airstrip on one artificial island and possibly a second on another. Other images suggest China has been working to extend another airstrip in the Paracel Islands further north in the potentially energy-rich South China Sea, a vital shipping route through which US $5 trillion of trade passed last year.